Edward C. Wente was born in Denver, Iowa, on January 2, 1889. He was awarded the A.B. degree by the University of Michigan in 1911 and the B.S. by Massachusetts Institute of Technology in 1914. He then joined the Western Electric Company's engineering department, predecessor of Bell Telephone Laboratories. 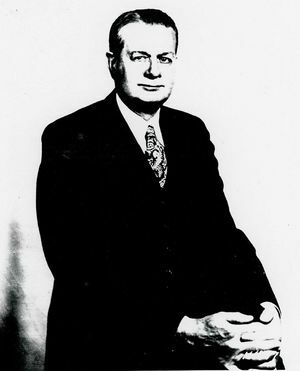 With the exception of a two-year period from 1916 to 1918 when he studied at Yale University for his Ph.D. degree, Dr. Wente continued to be associated with Bell Laboratories until his retirement in 1954. During his telephone career, Dr. Wente's research and inventions were for the most part related to acoustics and acoustical instruments; with special reference to their application to the transmission, recording and reproduction of speech and music. One of Dr. Wente's early developments was the condenser microphone, the first really high-quality transmitter, which made it possible for the first time to pick up sounds for transmission or recording with a fidelity that would permit reproduction with a satisfactory illusion of naturalness. The Franklin Institute awarded him its John Price Wetherill Medal for this work. Dr. Wente's development of the ribbon light valve for recording sound on film and his design of special microphones were of fundamental importance in sound motion picture technology. For these contributions he received the first Progress Medal of the Society of Motion Picture Engineers. Dr. Wente also pioneered and made important contributions the stereophonic transmission and reproduction of sound, architectural acoustics, sound recording on magnetic tape and, during World War II, to the development of a very-high-powered warning siren and the first electrical anti-aircraft gun director. Wente died on June 9th, 1972. This page was last edited on 22 January 2016, at 15:48.